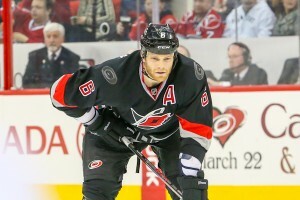 Last season Carolina Hurricanes’ GM Jim Rutherford made a surprising decision by choosing to sign UFA-to-be defenseman Tim Gleason rather than trading him for draft picks and/or prospects at the trade deadline. The non-trade has been paying off for the Hurricanes as they attempt to secure a playoff spot. As the Feb. 27 trade deadline approached last season, rumors and speculation began to swirl about Gleason being traded to a contending team. The Hurricanes were having a rough season that eventually ended with the team finishing in 12th place in the Eastern Conference, sparking the trade speculation. What the Non-Trade for Tim Gleason meant. Looking at the trade deadline deals that did happen, such as Nicklas Grossmann to the Philadelphia Flyers and Johnny Oduya to the Chicago Blackhawks, it is likely the Hurricanes would have received a 2nd round pick and another mid-draft or a middle-level prospect for Gleason, based on speculation. A trade in those regards would help the Hurricanes build for the future, but the non-trade has helped the Hurricanes more than the picks or prospects would have. Signing Gleason to a four year, $16 million deal allowed Carolina to concentrate on bigger needs in the off-season. Instead of focusing on replacing Gleason in free agency, Rutherford was able to deal for Jordan Staal and sign Alex Semin in free agency to improve Carolina’s biggest need in offensive depth. Without Gleason in the ‘Canes the ‘D’ corps, the team would be missing an essential shutdown defenseman in their top four. The main nucleus of the Hurricanes defense features puck-movers like Joni Pitkanen, Justin Faulk and Jaime McBain, while Jay Harrison would be the only stay-at-home defenseman Carolina would have. Because of this Rutherford may have chosen to re-sign Bryan Allen or fill the gap with an aging defenseman such as Scott Hannan. Allen ended up receiving $500,000 less than Gleason, despite being two years older, from the Anaheim Ducks. Gleason is averaging 20 minutes a game for Carolina and is proving to be valuable for Carolina’s blue line which has experienced injuries to Pitkanen and Faulk in the shortened season. Gleason is also the longest-tenured Carolina defenseman that is charged with leading a young defense that includes rookie Bobby Sanguinetti and second-year pro Faulk. The $4 million price tag is also a reasonable one for the former Los Angeles King. Comparable defenseman to Gleason includes Grossmann, Mike Komisarek and Zybnek Michalek, who all make as much as or more than Gleason. By keeping the defenseman, Rutherford proved that the Hurricanes were not in a rebuilding mode and by making a few off-season moves has turned the team into a playoff contender. The Hurricanes are currently in seventh in the Eastern Conference and trailing the Winnipeg Jets by two points for control of the Southeast Division lead as they continue to fight for their first playoff spot in four seasons.